deserves the "living legend" status. Since his initial impact on the music scene in the mid-1950's, Johnny has maintained a consistently high level of performance, both on recordings and on stage. Through the years, Johnny has demonstrated incredible durability and popularity, enjoying a singing career that is unique in the history of the music business. His rich, velvety-smooth voice has been delighting his listeners over a span of five decades! Johnny's distinguished career, his achievements and accomplishments as an entertainer have influenced and inspired and touched the lives of many of his colleagues and fans throughout the years and throughout the world. Marking his 46th Anniversary as a Recording Artist in 2002, Johnny Mathis' phenomenal success story is without equal. He has performed for Presidents, Heads of State, Royal Families, and concert-goers in virtually every corner of the globe. While many of his musical contemporaries find their careers waning, Johnny continues to perform, and to enchant his audiences, at the most prestigious concert performance centers, and at the major showrooms in Las Vegas and Atlantic City. Johnny holds many records, and has set many precedents in the music industry. In 1958, two years after being signed by Columbia Records, the record company released his fourth album, called it, Johnny's Greatest Hits, and thus began a "Greatest Hits" tradition copied by every other record company since then. Johnny's Greatest Hits went on to become one of the most popular albums of all time, and to spend an unprecedented 490 continuous weeks on the BILLBOARD Top Albums Chart, a record that has been noted in the GUINNESS BOOK OF WORLD RECORDS. According to record historian Joel Whitburn, Johnny is one of only five recording artists who had Top 40 Hits spanning each of the four decades after 1955. Amazingly, his second #1 Hit Single, "Too Much, Too Little, Too Late," (recorded with Deniece Williams), came almost 21 years after his very first #1 Hit Single, "Chances Are." As Johnny's Hits endure, his music continues to change and to grow with the times. He continues to record one new album annually. In September of 1995, Johnny performed for the 75th Diamond Anniversary Miss America Pageant, covered "live" on network television throughout the United States, and the world, from Atlantic City. In Los Angeles, in July of 1995, Johnny performed his 77th concert at the famous Greek Theatre, and was honored by being inducted into their "Wall of Fame," as the second biggest ticket seller in the long history of this amphitheatre. John Royce Mathis was born on September 30, 1935, in Gilmer, Texas. The son of Clem and Mildred Mathis, he was the fourth of their seven children, and grew up in San Francisco, California. When Johnny was a small boy, the large family lived in a basement apartment on Post Street, and it was there that he learned an appreciation of music from his father who taught him his first songs. Clem had worked for a time in vaudeville back in the 1920's, and he encouraged all of his children to sing. When Johnny was eight years old, Clem brought home and old upright piano that he had purchased for about $25 and he began teaching his young son songs and routines. Whenever visitors came to the Mathis home, Clem would have Johnny sing for them. Johnny was 13 years old when Clem took him to see Connie Cox, a Bay Area voice teacher, who agreed to take on the youngster in exchange for his doing odd jobs around her house. Johnny studied with Connie for six years, learning vocal scales and exercises, voice production, classical and operatic skills. Johnny sang in church, at school functions, at community events and amateur shows all over San Francisco. At George Washington High School, Johnny was not only a very popular student, well known for his singing abilities, he also became a star athlete on their track and field team, as a high jumper and hurdler, and was on their basketball team. In 1954, Johnny enrolled at San Francisco State College with the intention of being an English and physical education teacher. While there, Johnny set a high jump record of 6' 5-1/2"... which is still on the College's Top 15 list, and was only 2 inches short of the Olympic record of the time. Just as when he was in high school, Johnny's name was frequently mentioned in the sports sections of the Northern California newspapers. He was often referred to as "the best all-around athlete to come out of the San Francisco Bay Area." A fellow student at San Francisco State, a young man who played with a jazz sextet, talked Johnny into coming to the nightclub where he worked and singing with the group. It was a Sunday afternoon jam session at the BlackHawk, and it was co-owned by Helen Noga. When Helen heard Johnny sing, she decided that she wanted to manage his career and push him to the top. In early September of 1955, Johnny landed a job singing weekends at Ann Dee's 440 Club. Helen learned that George Avakian, then head of Jazz A & R at Columbia Records was vacationing in San Francisco. She repeatedly telephoned him until he agreed to come to the 440 Club to hear Johnny sing. Avakian came to the club, heard Johnny sing, and sent the now famous telegram to his record company: "Have found phenomenal 19-year old boy who could go all the way. Send blank contracts." Avakian left for New York, after telling Johnny that he would eventually send for him. He continued his studies at San Francisco State, and also gained additional fame as a high jumper. In early 1956, Johnny was asked to attend the trials for the 1956 Olympic teams that would travel to Melbourne, Australia that summer. At the same time, Columbia Records requested that Johnny come to New York to start arrangements for his first recording session. Clem helped his son decide that his future and best interests were with the recording company, and so Johnny gave up his chance to become a member of the USA Olympic Team. He went to New York to record his first album, in March of 1956. It was a decision that he would never regret. The first album was a collection of jazz-oriented renditions of popular standards entitled: Johnny Mathis: A New Sound In Popular Song. In conjunction with the release of his new album, Johnny was introduced to the music industry when he made his debut at the Columbia Records convention held that summer in July. The album enjoyed only moderate success, because jazz vocal albums were not good sellers. Nevertheless, Johnny remained in New York and landed bookings at some of the leading nightclubs such as the Village Vanguard, the Blue Angel and Basin Street East. VARIETY reviewed his early act: "Johnny Mathis is a promising newcomer. The lad from San Francisco is an intense singer with a musician's skill for vocal improvisings that make for an arresting session. Mathis seems to know where he's going, and at this stage of development it's safe to assume that he'll get along nicely." Soon, Columbia placed Johnny under the supervision of producer Mitch Miller, who favored using Johnny's voice to sing soft, romantic ballads. At his second recording session, in the fall of 1956, Johnny recorded two singles, two of the songs that were to become among his most popular all-time greatest hits: "Wonderful, Wonderful" and "It's Not For Me To Say." Subsequently, MGM Studios signed Johnny to sing "It's Not For Me To Say" in the film Lizzie, in which he played a tavern piano-bar singer. In 1958, Johnny made another motion picture appearance, this time for 20th Century-Fox in A Certain Smile, where he sang the title song, playing himself in an elegant nightclub scene. Since then, Johnny's voice has been used in countless Hollywood movies, often to sing the theme song over the credits, other times as part of the story, or for background music to enhance a particular setting or segment. "Wonderful, Wonderful" and "It's Not For Me To Say" reached their peaks on the BILLBOARD pop chart in July of 1957. These successes were followed by the monumental single "Chances Are" which became Johnny's first #1 hit. In June of 1957, Johnny appeared on the Ed Sullivan Show, where he was introduced to the record-buying public, and became a national celebrity and a household name. Columbia Records continued to release albums of Johnny singing beautiful and romantic ballads, classic standards and the best songs from Broadway musicals. These albums, like the singles, became immediate successes, with sales in the millions. It was not uncommon for Johnny to have as many as four albums on the BILLBOARD Top Albums chart at the same time. In late 1959, Johnny recorded another song that became synonymous with the name of Johnny Mathis, the Erroll Garner composition: "Misty." By now, Johnny was in great demand on records as well as on stage, and he was as popular with adults as he was with teenagers. It has been noted that Johnny Mathis became popular among teenagers in the era of rock 'n' roll, without ever singing a rock 'n' roll song. Although Johnny's contemporaries were such rock stars as Elvis Presley and Ricky Nelson, he was voted the Number One Male Singer for the year of 1960 in a major USA poll conducted among teenagers. By 1961, Johnny had toured Australia and Great Britain, where he was received with tremendous enthusiasm. In America, he set attendance records in many of the major nightclubs. He made guest appearances on all of the musical/variety television shows of the time. Johnny's performances became known as "Mathis Magic." In 1958, Johnny left San Francisco along with his managers Helen and John Noga, and moved to Beverly Hills where he shared a home with them. Six years later, he and the Nogas ended their business relationship. Johnny purchased a home in the Hollywood Hills, one that was originally built by Howard Hughes, and still resides there today. He established Jon Mat Records, Inc. to produce his recordings, and Rojon Productions, Inc. to handle all of his concert, theater, showroom and television appearances, and all promotional and charitable activities. His new manager and business partner became Ray Haughn, who helped guide Johnny's career until his untimely death in September, 1984. Since then, Johnny has taken full responsibility for his career, operating from an impressive office suite located in Burbank, a suburb of Los Angeles. He has remained with Columbia Records throughout his recording career, with the exception of a three-year period with Mercury Records in the middle 60's. From his first recording, Johnny has released over 100 albums, and about as many singles, in the United States alone, and scores of albums in foreign countries. He is truly an International SuperStar, who has performed in North America, South America, Europe, Australia, Africa and the Far East. Johnny's accomplishments are numerous and varied. In June of 1972, he was awarded his own star on the famous Hollywood Walk of Fame. He has made many appearances at the White House, starting in June of 1973, when he sang at the State Dinner held in honor of the President of Liberia. Then in April of 1987, he sang for President and Mrs. Reagan at the State Dinner held in honor of the Prime Minister of Japan, and again in April of 1991 for President and Mrs. Bush in honor of the President of Nicaragua. In October of 1987, he was invited to the White House to sing at a Jerome Kern Tribute. Most recently, in May of 1994, Johnny performed for President and Mrs. Clinton at a very special First Ladies Tribute. In 1978, Johnny sang for the British Royal Family at a Command Performance held at the London Palladium. Johnny has participated in the Academy Awards presentations many times, to sing the song nominated for the "Best Song" category. Johnny has received two Grammy nominations. The first was for "Misty" in 1960, in the category of Best Vocal Performance Single Record or Track - Male. The second was for In A Sentimental Mood/Mathis Sings Ellington in 1992, in the category of Best Traditional Pop Performance. Over the years, Johnny has been a frequent guest on all of the well-known talk shows of the day. On the "Tonight Show" alone, he has guested over 50 times since 1962. When Johnny was celebrating his 25th Anniversary as a Recording Artist in 1981, the City of Hope/Music Industry Chapter paid tribute to him at a gala dinner held at the Century Plaza Hotel, where he was presented with the "Spirit of Life" award. Johnny was among the first major singers to become a member of the Society of Singers (SOS), and gives generous support to this organization. Sports are still a major part of Johnny's life. He continues to be extremely health conscious and remains in excellent physical condition. He especially enjoys golf, and plays nearly every day. He plays in golf tournaments throughout the year, and is often asked to sing at the golf banquets of the major Golf Tournaments, such as the Ryder Cup. In 1985 and 1986, Johnny hosted his own golf tournament, The Johnny Mathis Seniors PGA Classic, held in Los Angeles. At San Francisco State College, The Johnny Mathis Invitational Track & Field Meet has been held annually since 1982. Johnny has often taken time out from his busy schedule to attend the meet, where he can reminisce about his own days on that field. Besides his interest in sports, and his love for golf, Johnny has developed his talents as a cook and enjoys preparing meals for himself and his friends and family, especially on special occasions and Holidays. Johnny celebrated the year 2000 with the release of a new CD of show tunes, Mathis On Broadway. His latest CD, released in October of 2002, is a delightful selection of Christmas songs, The Christmas Album. Johnny Mathis is basically a modest and private person, who lives a quiet and unpretentious life. He started out as a little boy singing mostly to please his father, whom he loved and considered his best friend. Now the years have passed, and Johnny sings mainly because singing is his life. Music is the most important thing in his life, and he has wanted simply to be a singer of good songs and to sing them well. Still, Johnny has enjoyed his career and the accompanying opportunities to do the many things that otherwise might not have been possible. Johnny's singing voice and style have been described by hundreds of reviewers and writers over the years. Thousands of words have been written about Johnny's superb artistry and musicianship, his stunning song interpretations, his incomparable phrasing and articulation, his brilliant microphone technique, his remarkable professionalism, his impeccable and youthful appearance, his shy and innocent charm. It has been said that Johnny sings right from the heart, from deep within his soul, that he gives a song his all, that he projects a warm, sincere and sensitive personality through his incredibly beautiful sound. He has been called by many: "The World's Greatest Romantic Singer." 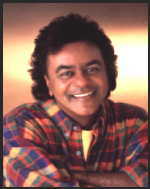 Johnny Mathis is a legendary performer who has uniquely and enduringly communicated with all audiences through his timeless music, true class and voice of romance.